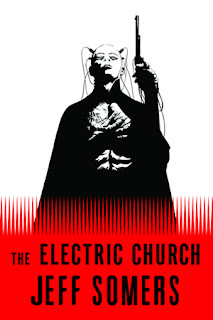 For some reason, I can't say that Jeff Somers' The Electric Church piqued my curiosity when I received the ARC. A few weeks later, as I was looking for something not too bulky to bring along for my trip to NYC and DC, I decided to give this Orbit USA launch title a shot. The story was occurring in New York City, which sort of made it apropos. I started reading this action-packed novel on the eve of my departure, and I would have read The Electric Church till the wee hours of the night had I not had an early plane to catch. I was immediately sucked into this cyberpunk/noir science fiction tale. An explosive near-future thriller in which Kill Bill meets Blade Runner -- that's how they sum up this book on the back cover of the ARC. I figure that's as good a description as any! Avery Cates is a Gunner -- a hitman. As if his life isn't complicated enough, he finds a way to screw up in spectacular fashion when he kills a cop. From that point on, Cates is basically a dead man walking with the entire System Security Force on his trail. Somehow, Cates will dig himself an even deeper hole by killing more cops as he desperately attempts to save his own skin. Realizing that his miserable life has reached its expiration date, Cates will do the only thing that might see him survive. With no other alternatives this side of death, he will accept to kill someone for Director Richard Marin, of the SFF Department of Internal Affairs. His target: Dennis Squalor, founder and chief prophet of the Electric Church. The only problem is that, since Marin cannot be seen getting involved, Cates must face the SFF and the Monks of the Electric Church in order to succeed and possibly save his own life. The worldbuilding is not your typical post-apocalyptic environment, though the premise is similar. About two decades in the past, the Riots were quelled rather violently, and every country on the planet is now part of the System of Federated Nation. Since Unification, the System Security Force, the corrupted military arm of the Joint Council, maintains order by taking lives instead of asking questions. It's an extremely gritty setting, and Somers' portrayal of near-future New York City and London is brilliant. The characterization is the aspect that propels this story forward. First-person narratives can be tricky, especially when you're dealing with the POV of a disreputable criminal like Avery Cates. He's kind of a prick, no question, but it's impossible not to like him! As for his supporting cast, a more endearing band of misfits I would be hard-pressed to name! The best characteristic of this novel remains its swift pace. Unlike most scifi books, which can be filled with numerous info dumps and slow-moving story arcs, The Electric Church reads like a thriller. Jeff Somers shows that he has quite a few tricks up his sleeve. The addition of psionics was a nice touch that worked really well in the overall scheme of things. In addition, the whole premise behind the Monks, the Electric Church's converts, who abandon their flesh for enhanced robotic cyborg bodies with human minds, was quite fascinating. With eternal lifespans, they seek to achieve Salvation. Jaded readers tired of the "same old" should definitely give Jeff Somers' The Electric Church a shot! As for me, it is with curiosity and eagerness that I will wait for the sequel, The King Worm. Apart from Brian Ruckley's Winterbirth, this could well be Orbit USA's most interesting launch title. It will be released in a few weeks from now. . . You can learn more at http://www.orbitbooks.net/, http://www.jeffreysomers.com/ (this guy's blog is hilarious! ), and http://the-electric-church.com/ (under construction). I'll let you guys know as soon as sample chapters appear online. . .